Image caption Russell O'Connor filmed himself during the break in and could be heard saying: "I'm Russell O'Connor, this is Totnes police station. They are all asleep." A man broke into an empty police station and filmed himself trying to hack into a police computer. Russell O'Connor stole handcuffs and an extendable baton from the police station in Totnes, Devon, Exeter Crown Court heard. He broke in twice in the early hours of 21 December, going back the second time to try to find a working police radio. 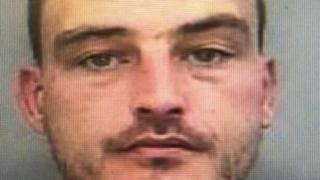 O'Connor admitted two counts of burglary, having offensive weapons and possessing cannabis. The unemployed 36-year-old, from Redruth, Cornwall, also took a can of Captor incapacitating spray, two torches, a police fleece, a velcro backed police badge, a lock picking kit, a palmtop computer, and the keys to a police car. Ed Bailey, prosecuting, said O'Connor first went to the police station at 01:57 GMT and used the phone to ask to see someone. After being told the station was empty, he left the phone off the hook and walked around tapping windows and trying to open doors. He claimed he walked in through an open side door but a locksmith concluded he picked the lock, the court heard. Mr Bailey said: "He recorded his search on his mobile phone and as he attempted to gain access to the police computer in the sergeant's room. "He could be heard saying he was looking for a smart card and muttering to himself." O'Connor went back to his caravan before returning to the police station, where he broke in again but was caught by two officers who had returned without realising he was in there. Paul Dentith, defending, said O'Connor went to the police station because he was in a state of mental turmoil and wanted help. O'Connor will be sentenced on Thursday.